Indonesian state-owned bank, Bank BRI, is one of the biggest banks in Indonesia that are specializes on micro segment. 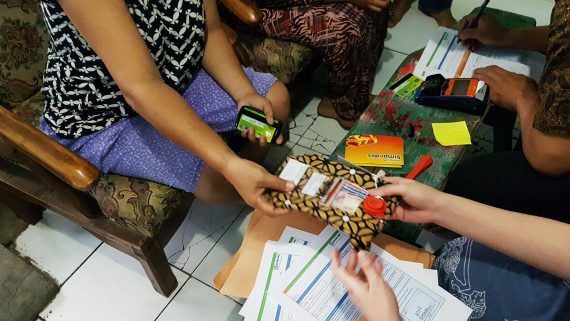 As a way to help adult population in Indonesia who are still unbanked or underbanked, Bank BRI wants to find a way to help the customers do savings that are more convenient for them. Many of them still rely on cash for daily transactions. They keep their money at home, in a piggy bank, or join informal neighborhood saving program. This way of saving money is prone to thief and cheat. The customers themselves often get itchy to open their piggy bank and use the money. Bank BRI in collaboration with Somia, a Customer Experience consultant agency, did an immersive research across Indonesia to understand micro segments’ lives and financial behavior. We found that there are financial costs associated with savings money in a bank such as transportation costs, time consumption and long queue. Emotionally, they feel ashamed going to the bank depositing small amount of money. The target is micro segment customers in Indonesia, who are still unbanked or underbanked. They have done savings through informal / traditional channels and highly rely on social interaction. Many still do not use smartphones, which brings high barrier for digital solutions. The other target is bank agents, pop shop owners who live in the neighborhood, and act as agents for the bank. They help people in the neighborhood to make financial transaction, and in return, earn transaction fee. This transaction fee is considered cheaper by customers compared to the cost to go to the bank. Our approach is for customer to do savings that are close to their everyday habits and yet helping them to do savings in a safer place such as bank. From Bank BRI perspective, Bank BRI wants to increase CASA (Current Account Savings Account) through this project. We designed a tangible wallet that is locked and can only be opened by the bank agents. Customers can set aside some money in the wallet everyday and deposit it to their bank accounts through the agents anytime they want. The wallet helped customers to be more discipline with their savings, and easier to save money to the neighborhood agents. Many have switched from traditional channel to the bank, using this solution. Bank agents also found that the program has helped them to increase their income through transaction fee and more customers shopped. Multiple iterations were done with the design of the prototype product, communication materials, distribution program, reminder channel, reward system, and recollection. After we tested the prototypes, we found that the customers treated the wallet as something that was personal and discrete, thus the wallet is designed to be foldable and easy to hide. In terms of communication, these segments needed simple, daily language instructions with real photos instead of thorough, detailed instructions with illustrations.